At the beginning of this year, as some of you may know, we welcomed twin daughters into the world. They’ve slept in bassinets and cribs for a while now, but every once in a while we find ourselves all on the bed together, and once you throw a dog or two in there, it gets really crowded, really fast. For those reasons, and because it was overdue to begin with (we were using a 10-year old mattress), we decided to shop around for a new mattress. We live in Phoenix, and have seen quite a bit of press and coverage for Tuft & Needle. We also had a few coworkers who recommended the mattress. So we started there, and then looked into other direct-to-consumer mattress companies, like Casper, Leesa and Yogabed, to name a few. It was clear after a while that this was the future of mattresses, at least for us (we hate mattress shopping in person), so we spent quite a few hours looking into which products would work best for us. In the end, we chose the mattress that seemed to fit our family and needs best, and in the process, we ended up with literally thousands of words of notes, scribbles and reviews that we’d found online. We discovered that a few of our friends were going through the same comparison process, so we decided to formally review the Tuft & Needle vs Casper debate so that others could see the research we did as well. Because we live in Phoenix and feel somewhat closer to Tuft & Needle, we started there, then looked closely at Casper mattresses. In the end, both seemed to be great value mattresses that are convenient and meant to work with those who have a busy lifestyle, and that’s exactly what we were looking for. Read on to see how we chose the winner between Tuft & Needle vs Casper mattresses. Value and affordability: look, we have twins. We want comfort and a good night’s sleep, but we don’t want to pay thousands and thousands of dollars for it. Part of our mission in going with one of these companies was to find a good value mattress that would allow us to get sleep without costing an arm and a leg. Good quality: we wanted something that was affordable, but still good quality. We’ve had crappy mattresses before, and didn’t want another one. Cooling factor: we live in Phoenix. If that doesn’t explain it all, let’s just say that having a cool bed is one of the “must haves” in our lives, especially in the summer. Firmness and support: I like firm beds and my wife does not; we wanted to find a bed that balanced both of these, without us having to use an additional mattress topper. Bounce and movement: I’m a light sleeper, so I move every time my wife does. We wanted to find a bed that, while comfortable, absorbed movement and bounce. Trial period: we know that laying on a mattress in a store isn’t a good way to find the perfect mattress, so we wanted to go with a company that had a good trial period. Free shipping and returns: because we are Amazon Prime members and we’re used to that sort of thing. Warranty: we wanted a mattress that we’d have for a while, knowing that it would be replaced if anything went wrong. Customer service: we wanted to go with the company that felt good to work with, and we really appreciate those companies that go out of their way to make customers feel wanted and respected. Tuft & Needle was started by JT Marino and Daehee Park after JT and his wife had difficulty navigating the mattress buying process. They’re confusion was our gain, as the two friends quickly got their plans together and launched T & N in 2012. Today, it’s considered one of the most disruptive mattress companies in the business, and they’ve spawned a slew of similar companies trying to copy their success. So what is it that makes Tuft & Needle so appealing? To begin with, the company claims to make an exceptional mattress at a fair price. Their mattress model – a single model offered in different sizes – starts out at a reasonable price, which gets the fair price down. The “exceptional mattress” is harder to quantify, but it’s clear that many people the country over have been tremendously satisfied with their Tuft & Needle mattress. According to the company, it has the Internet’s highest rated mattress, and from what it looks like, they’re right. The overwhelming majority of reviews for Tuft & Needle mattresses are positive, and they all tend to mention the same thing: that the mattress is a great value for what you pay. Again, the Tuft & Needle market isn’t so much sleepers that want the absolute top-of-the-line models; it’s people who want the perfect balance of cost and quality, and in that respect, the company has hit the mark. Most reviewers found the mattress to be an overall great value; it might not be the top mattress model available, and it might not also be the cheapest out there (check out Zunis for something even more inexpensive), but what it does perfectly is combine affordability, quality, convenience and exceptional customer service in a way that few other companies do. Most complaints were due to personal comfort levels that cannot be determined without trial and error and testing out the mattress, but there were occasional negative comments and feedback that can be considered. 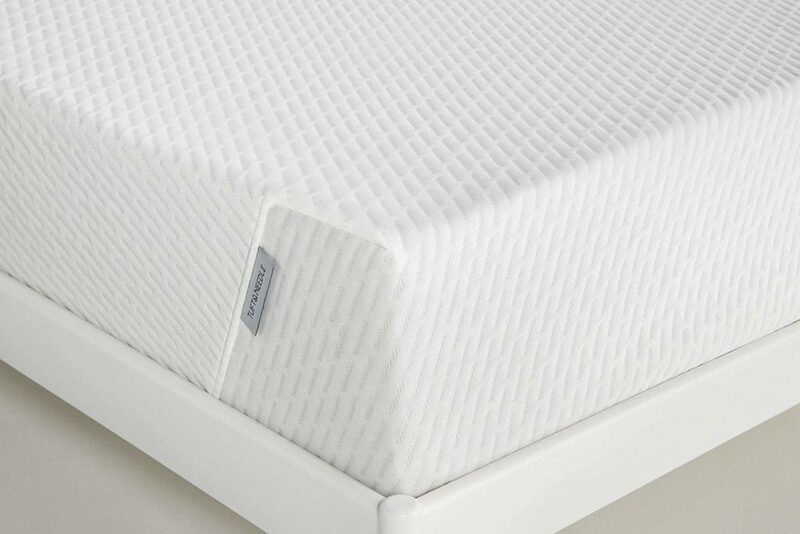 Overall, the firmness of the mattress was by far the leading complaint, so those sleepers who are more prone to firmness problems should probably consider a slightly softer mattress, like the Casper. We may be swayed by Tuft & Needle being a local company, but the reviews speak for themselves. The number of satisfied customers can’t be wrong, and the company even makes a point of being a good listener to its customers. Because of that, it’s made changes and adaptations since day 1 that have helped them create a really nice mattress at a good price. They may not be the most exceptional mattress on the market, but if you’re considering the Tuft & Needle vs Casper argument, then you’re not necessarily looking for the “most exceptional” – you could go with expensive luxury brands at a showroom, instead. Rather, you’re looking for an exceptional value that’s convenient, easy to test and even easier to get the hang of. And that’s what Tuft & Needle does perfectly: they offer value, affordability and convenience, and for those reasons we were really impressed with what we saw. Even with the complaints about firmness, there were far more reviews that mentioned the perfect combination of firmness, comfort and support, so although that feedback does exist, the percent of people satisfied with the firmness of the mattress far outweighed those who were not. Casper is a relative newcomer to the mattress market – even more so than Tuft & Needle, which was founded in 2012. Though they’re new to the party, they’ve managed to capture a good amount of market share in the direct-to-consumers mattress world, competing with brands like Leesa and Yogabed, along with Tuft & Needle. Their website focuses on their approach to designing and delivering mattresses rather than their history as a company, so you don’t get quite as much of an emotional/narrative appeal as you do with Tuft & Needle, which explains on their site how the two co-founders came up with the idea. For that reason, I found the Casper website to be appealing and clean, but didn’t quite have the same “human” touch that Tuft & Needle does. 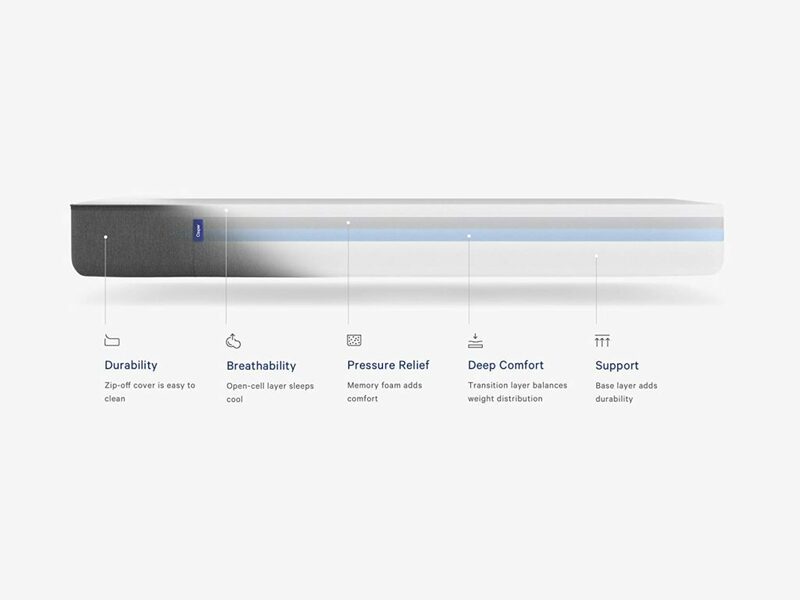 Casper offers one mattress model and it seems relatively straightforward. They offer twin, twin XL, full, queen, king and California king size mattresses. 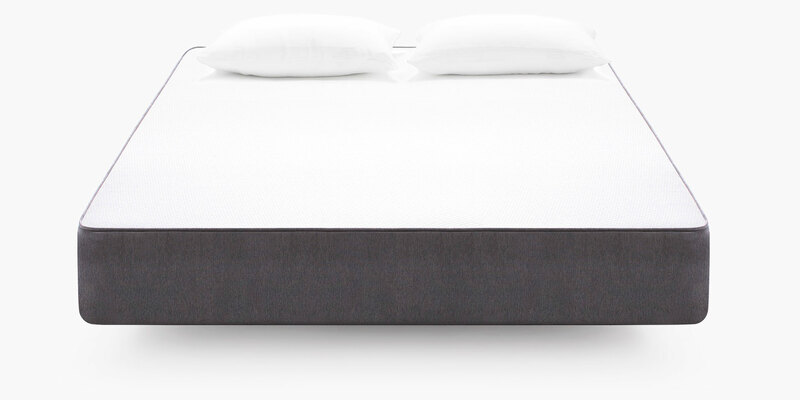 The mattresses themselves are relatively straightforward as well: each size contains 4 layers of foam , including an open-cell latex foam for surface comfort and coolness, a responsive memory foam, an adaptive transition foam to balance comfort and firmness, and a durable support foam for structure. The cover is simple, woven and has no frills, which is fine – that seems to be the industry standard when it comes to similar direct-to-consumer mattresses. The mattress model is one-sided, so although it can’t be flipped over, you can rotate it however often you like (every few months is a good baseline) so that you don’t wear it down in the same spots after time. We had a few friends who bought the Casper mattress and were satisfied with the way it felt after a few months, but we also decided to do a little bit more digging before making our final decision. Looking over the reviews and feedback online from real Casper mattress users, it was clear that they had a solid business model with satisfied customers: offer a quality mattress at an affordable price and top it off with customer service that can’t be beat. And in that game, Casper is doing great. Even though they have one model, it’s a good one to start with, and a strong majority of consumers found the Casper to be a good purchase. Most satisfied customers claimed that it was the value of the mattress that made it a good purchase, and many reviewers noted that the Casper offered quality, comfort and support that rivaled more expensive, traditional brands like Tempur-pedic and Sleep Number. 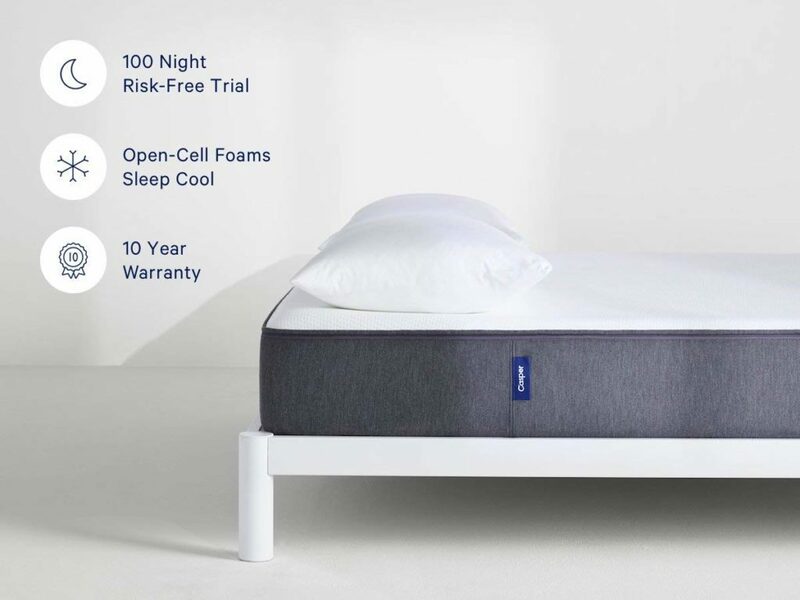 These are not limited to only Casper, however: many more companies are starting to offer extended trial periods and free returns and shipping, and for a mattress startup to compete in today’s market, these are a sort of starting point rather than anything that will keep your brand standing out from the crowd. Overall, the vast majority of Casper customers were incredibly happy with their decision, and it seemed that the few customers who weren’t happy with it complained about its firmness, which the company remedied by sending free mattress toppers to if it was during the 100-night trial period. The customer service you get with Casper is incredibly good, and the product is also great quality, but makes its name by being an affordable, value mattress that will give you the comfort and support you need without breaking the bank. To be quite honest, there’s not a whole lot of bad feedback for the Casper mattresses. If anything, it can be said that the mattress is quite as innovative or groundbreaking as its marketing messages make it to be, but in an industry that’s undergoing a lot of disruption from small, hungry competitors, that’s not unexpected. One or two customers also reported that the Casper was not great for those who have fibromyalgia; if this describes you or someone you know, we suggest seeking medical advice before making a final decision on your mattress, as that is beyond the scope of this article and most mattress reviews. In the end, the Casper mattress is a quality product with a lot of above-average services surrounding it, including the company’s customer service, trial period and free shipping and returns. For all that good stuff, however, customer service doesn’t always mean a good night’s sleep, and although Casper’s mattresses are solid, they’re also somewhat par-for-the-course when it comes to today’s direct-to-consumer mattresses. They’re extremely competitive and their clean, well-designed website and marketing campaigns are effective, so they’re getting a good amount of the market as time passes. If you’re looking for a good, affordable mattress and don’t want the hassle of going into a store and dealing with sales floors and salespeople, the Casper is a great option. It doesn’t have the frills, bells and whistles of some mattresses, but it does compare nicely to Tuft & Needle. Tuft and Needle vs. Casper: Who Wins? 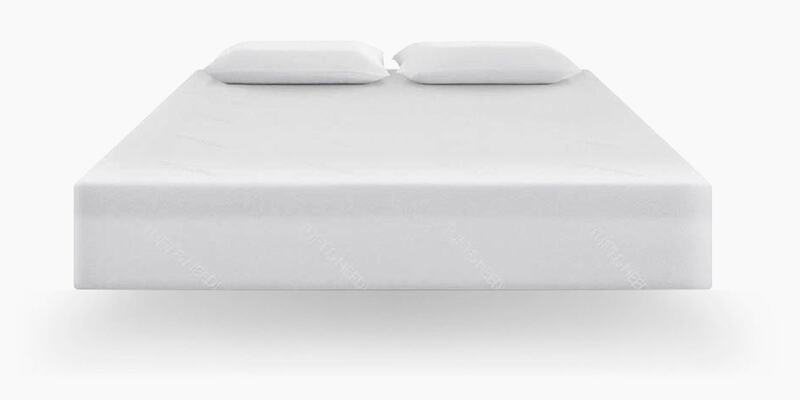 If you’re looking strictly at price, we would recommend the Tuft & Needle mattress because you can get similar, if not better, quality and comfort for about 20% to 30% less. 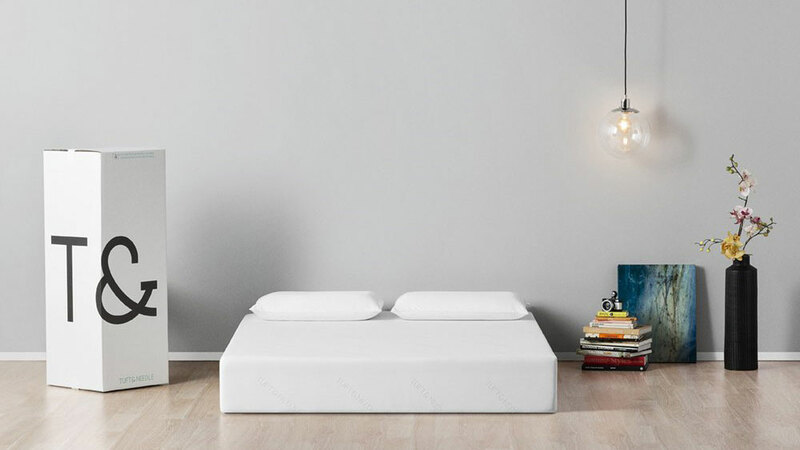 The Casper mattress is a great value, but it’s more expensive than Tuft & Needle and doesn’t necessarily offer anything that makes it a better buy than Tuft & Needle. Both companies offer similar 100-night trials, free shipping, free returns, great customer service and 10-year warranties. So to us, the biggest differences come down to Tuft & Needle having a local presence where we are, being more affordable and actually using materials that are designed by their own research and development processes. If you’re looking at overall value, comfort, support, features and benefits, we’d still hand it to Tuft & Needle. Casper offers a great business model, but in the end, it just didn’t blow us away. They’ve been around for only a few years now, so the changes and adaptions they make in the future could change this, but for now, we’re going to go with Tuft & Needle. For those reasons, we gave the Casper 2nd place in the Tuft & Needle vs Casper debate, but really, going with either mattress will give you a product that many, many people in the country have found to be extremely comfortable and a valuable addition to their homes. 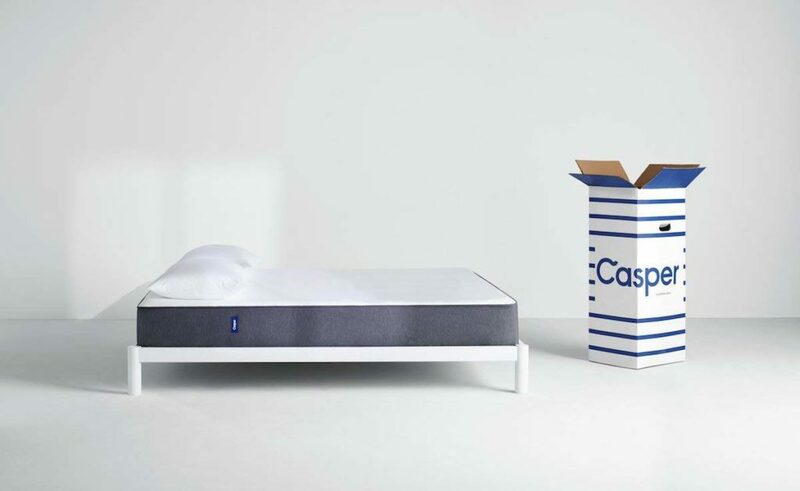 For Casper to be a front runner in the game, we’d like to see either additional models of mattress that provide more flexibility in firmness, or some other reason – aside from killer customer service and support – to pay more than 20% to 30% or more than a Tuft & Needle mattress. For these reasons, we chose the Tuft & Needle king size mattress for our bedroom, and we’ll update this review as time goes on. We also have a guest room and second bedroom that have beds, so we’ll also be reviewing beds from Leesa, Yogabed and Zinus in the future. We hope you found this review helpful – we spent a lot of time doing our own research when it came to finding the right direct-to-consumer mattress, and we hope that you can take some value away from our research as well. If you did find this helpful (or didn’t! ), feel free to let us know! Good luck with your mattress search and have a great night’s sleep!